This weekend, hike to naturally eroded bridges deep in the expansive Terry Badlands Wilderness Study Area, where famous wild west photographer and homesteader Evelyn Cameron once took her famous self portrait atop the bridges. Directions: From Missoula, head east on Interstate 90 to Billings and then take Interstate 94 east towards Bismark, North Dakota. About two and a half hours past Billings (well past Miles City) you’ll reach the town of Terry. Depart the highway here, at Exit 176, and head north on 10 Mile Road for a half mile until you reach Spring Street. There, turn left (west) through Terry and onto Old Highway 10 about 1.8 miles outside of town. Turn right on Milwaukee Road and then, after another 2.6 miles, you’ll cross the Yellowstone River on an old railroad bridge. After crossing the bridge, drive another half-mile to a dirt parking area with an interpretive sign. This marks the beginning of the Calypso Trail, a rustic road. Take the trail, which immediately curves to the left, about 8.2 miles to the end of the road and then park. Note: A high-clearance vehicle may be required for this final leg, and the road is impassable when wet. Also, keep left at the only fork in the road, which comes at about 7.7 miles. 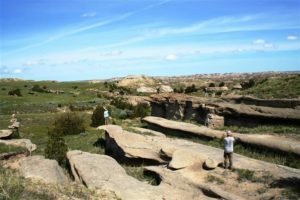 What to expect: The natural bridges hike begins at the end of the Calypso Trail and takes hikers through prairie fields where one can catch glimpses of beautiful badlands and abundant wildlife. The trail is mostly easy to follow because of BLM posts that mark the trail, however in some places these posts may be down or damaged. Retrace your steps and carefully scan the horizon for the next post if you lose the trail. At one point the trail will come to a gate. Hikers can pass through this gate as it still resides on public land. Continue past the gate. The trail will curve west and south, crossing downstream of a broken earthenworks dam. Soon you will come to the natural bridges. There will be an eroded valley to explore and natural bridges along its edges.